The first time we met our birth mom she said that I was welcome to come to her appointments with her. Today was the first appointment since then that I've been able to go to. It was only the second time I've ever seen her in person. I was so nervous. There was some error in communication, and the due date of February 1st, isn't correct. Our baby is due March 4, 2013 (as per the doctor). You have NO IDEA what this does to get rid of my anxiety. We are going to finish our home study in the next week, and our social worker told us that it will take her a few weeks to write up her final report. I was so worried that the baby would come early and all of our ducks would be misaligned. An extra month is golden. I can't wait for SuperBaby's arrival, but I do want to make sure we have everything done properly first. 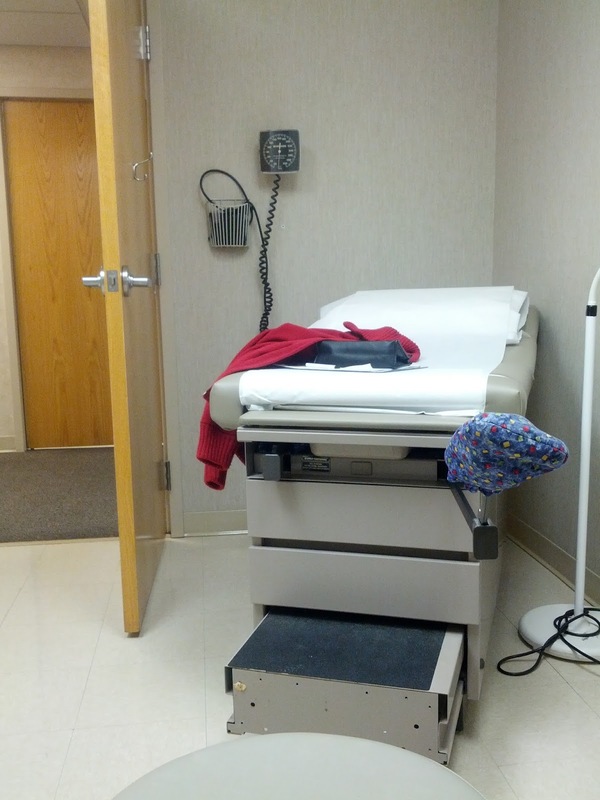 I didn't have a clue how prenatal visits went, so when I was told to sit in the chair that gave me this view, I kind of panicked. Turns out, not all visits are like annual exams, and everyone kept their clothes on. Whew. Our birth mom is 27 weeks pregnant. She is experiencing round ligament pain and headaches. Her blood pressure is good, as is everything else. The baby is the size of a rutabaga. I was sitting, listening, taking it all in when the doctor told me I was listening to the heartbeat. I thought he was having trouble finding it or something, but then he told me that noise was the heartbeat. I wasn't all mushy about it until the appointment was over. We waited to get all of birth mom's blood tests and her sugar test done today. We sat in the waiting room talking for an hour, and it went really well. After we finished everything, we went to our attorney's office so he could explain everything to the birth mom. She agreed with everything he said and told him that no matter what, she wants the baby to come to us. Today gave me great peace of mind, and made me even more excited for what is to come. Such a great update!! Annnd hearing the heartbeat. So so happy for y'all!! It was so awesome. I'm so lucky that I'm able to be there! I love this! It's getting so close. I'm so excited for you guys! This is exactly why I need you to live closer. Half of the people I need at the baby shower live soooo far away! What an amazing day for you! Congrats, Mom! Thanks, Shoe. :) It was pretty awesome. Love this update and March is a great birthday month! I don't know how I missed this! How awesome is this?!? How amazing!! <3 I'm so happy for you! (psst the last month is where they will do the vag checks ;) so you're safe for a while). Thanks for the warning Lisa! So exciting! Hearing the heartbeat will never get old!